Dacre Castle was constructed in the 14th century and was once the meeting place of three kings in ancient times who got together (unsuccessfully) to arrange a peace treaty between England and Scotland. Their regretful ghosts are said to make an appearance at the castle to this day. However a much more macabre haunting has been described as follows. In the 15th century, Sir Guy Dacre, a young heir to the Castle fell in love with Eloise, the daughter of a French nobleman. Unfortunately she rebuffed his advances and he enlisted the help of his Italian tutor to help him win her affections. Unbeknown to him however this same tutor soon began an affair with Eloise whilst he was away fighting in Scotland and when he returned and she agreed to marry him, he was still unaware of this affair. When Sir Guy once again left to fight in Scotland, he entrusted the castle to his loyal friend Lyulph who soon learned of the deception. Eventually the lovers left the Castle and moved to York and Lyulph told Sir Guy the full story. Sir Guy set off in hot pursuit and soon brought back Eloise to his castle where he locked her in a dark dungeon. In this terrible place, she turned to see her lover chained to the wall and when she tried to kiss him, his head rolled from his shoulders to the ground! Sir Guy's loyal friend had evidently captured him also. Eloise was kept captive in the cell and eventually she went mad and died beside the rotting corpse of her lover. 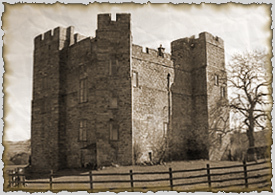 Their tragic ghosts are said to haunt Dacre Castle to this day!